Sasame is the Knight of Sound and has a job as a radio personality, addressing people's problems on the air. Sasame enables Himeno to strengthen her abilities as Prétear, by not only teaching her how to use her powers, such as the Sonic Arrow, but by also providing her with advice. Much to her embarrassment and maybe small crush on him. Though appearing to be well-balanced and sure of himself. He too has some dark secrets (in the anime, although hinted at in the manga). Sasame later is revealed to only want to help Himeno and her being Pretear, to just use her to get what he wanted. 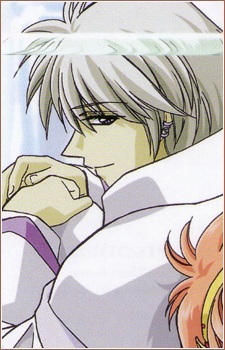 Which was infact due to his hidden unrequieted love for Takako, to become her Knight of Darkness. Pitting him against the Leafe Knights and the Prétear. In the manga: He did indeed love Himeno, but about the love triangle, he did not want to go against Hayate. So he said that he only wanted Himeno to see him as a "big brother" from that moment on. There was strong hints that he was in love with Takako in the manga as well, but became angry when she ignored him for Hayate (shown in his conversation with Kei toward the end of the manga).